Each season Cheshire County FA run a Competition for Representative teams from the 9 Districts Affiliated to CCFA. This season there were 6 District who took part and Wirral were in one of the toughest leagues drawn. With a longstanding tradition of winning this competition Wirral had, for the last few seasons just hit the crossbar. This season our management team of Mike, Jason, John & Nathan were determined to reap the benefits of their hard work in the selection trials, training and the qualifying games. 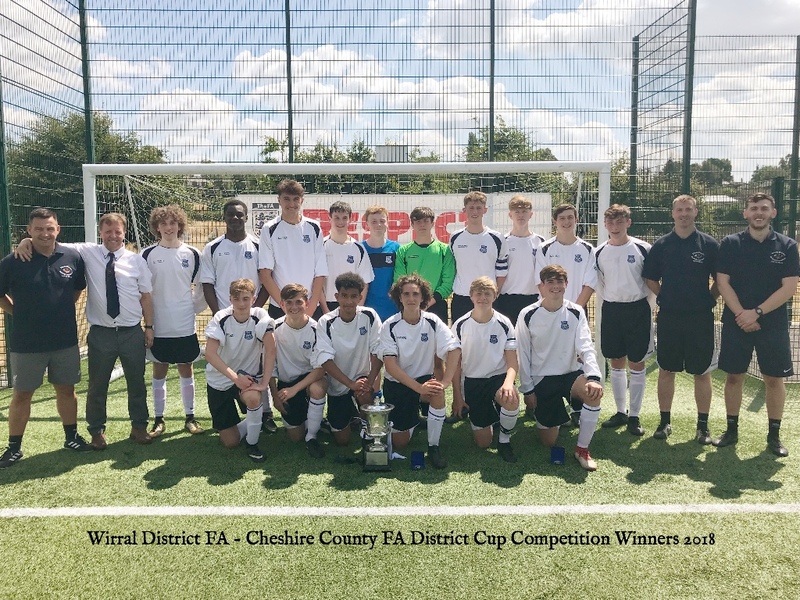 Below our the match reports from Mike Melling on three great games which culminated in Wirral once again leading the County in Youth Representative Football. 4-2. The 2nd half was all about not conceding and defend properly. An unfortunate deflection off one of our defenders heads gave Crewe hope 4-3. The players though kept them out and had a chance or two increase our lead but couldn't convert them into goals. Team- Tom Douglas, Effion Alpha, Bobby Evans, Luke Warrington, Liam McDonald, Kyle Platt, Tom Bradshaw, Ellis Bolton, Harris Randles, Leighton Clark, Toby Seal subs. Joe Joinson, Chiz Onyeogi, Mike Kinsella, Aaron Rainbow-Adams, Nathan Penny. If Mid Cheshire were to reach the final they would have to defeat us by a better margin than their loss to Crewe. We desperately wanted to reach the final and the players were up to the task by taking the game to Mid Cheshire from the off. It was wave after wave of attacks but with some great goalkeeping and a bit of luck Mid Cheshire held out. After a mix up with who's throw it was Mid Cheshire took full advantage, created & scored while we were still contesting the throw in. A superb strike against the run of play and we found ourselves 2-0 down at halftime. After a good chat in the changing room and a rousing speech from Jason Aldcroft the players went out determined to put things right. 5 goals without reply, Tom Bradshaw 2, Luke Warrington 1,Ellis Bolton 1 and Toby Seal 1, the players blitzed their way to the final on 7th July 2018. Team. Tom Douglas Effion Alpha Bobby Evans Ellis Bolton, Luke Warrington, Liam McDonald, Kyle Platt, Harris Randles, Aaron Rainbow-Adams, Leighton Clark, Toby Seal, Subs Joe Joinson, Chiz Onyeogi, Tom Bradshaw, Sam Mullally. Before K.O. there was a minute silence due to the sad loss of Mr Frank Walsh, who had served the District admirably over many years. The game started with Altrincham in the ascendancy and looking confident and dangerous. Wirral managed to cope with their greater possession and territory, until we lost possession too easily and Altrincham capitalised with the opening goal of the game. The players never let this effect them and were pushing for the equaliser which came via a penalty after a superb run by Ellis Bolton and ended with him being brought down in the box. Leighton Clark duly stepped up and slotted the ball home 1-1 after 40mins.... Halftime. Before the start of the 2nd half we decided to swap our wide players Ellis and Tom Bradshaw to opposite flanks. A move which reaped early dividends after a superb delivery by Ellis ended with Luke Warrington helping the ball into the back of Altrincham’s goal, 53mins 2-1 up. The switch was really having a greater effect this half. 5 minutes later and an absolute worldly from Toby Seal put Wirral 3-1 up on the hour mark. The game was far from over as Wirral were definitely not having it all there own way and Altrincham were still causing problems and looking dangerous on their attacks. That eventually paid off with a goal on 75mins 3-2. During the 2nd half Arron Rainbow-Adams replaced Sam Mullally in midfield & our next sub Chiz Onyeogi replaced Toby up front.Altrincham sensed they were on top now and pushing for the equaliser. On one of their attacks we managed to get the ball back on our 18 yard box and a quick ball up to Big Chiz (who Altrincham had left only 1 player marking him as they through everything at us,) who was to strong for their last man was away and going for goal. The Altrincham keeper came rushing out of his box in a bid to beat him to the ball only for Chiz to coolly slot the ball passed him and into the net 84mins 4-2. Our final sub saw Kyle Platt replace Tom Warrington. We managed the game quite well until the final whistle and Wirral had won the 2018 final. Harris Randles, Leighton Clark, Toby Seal, Ellis Bolton, Joe Joinson, Mike Kinsella, Arron Rainbow-Adams, Chiz Onyeogi, Kyle Platt.